Can I make it myself or learn how to? Make it yourself can be much easier than you think. You can literally diaper with stuff you probably already have around the house. Have some old 100% cotton -shirts hanging around waiting to go to the thrift store? They make a great diaper. Flour sack towels work well, too. Those fifty extra receiving blankets you got from your well meaning friends? Potential diapers! Got a wool sweater or old fleece you want to re-purpose? Simply cut out a T shaped piece as a simple diaper cover. Use the wool as a water resistant cover and fold your absorptive diapering material of choice into a rectangle. Tie on to baby, and viola, diaper! So that was the most simple DIY diaper set up. I’ve used them in a pinch and they work just fine, all though I prefer not to have to tie my covers. 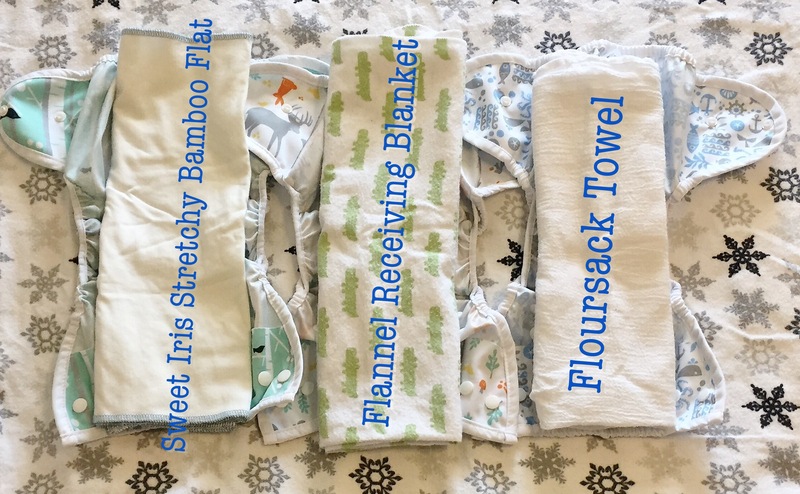 What we actually use around here are DIY flat diapers made from Bamboo Stretch Terry that I purchased from Nature’s Fabric for the absorptive layer. You can get it in a bunch of colors and it is one of my favorite diapering materials. The only skill you need is the ability to cut in a semi straight line. Mine are 30” x 30” which are Toddler size. I don’t normally make my own covers, as sewing is not a passion of mine. If it is for you there are patterns for fitted diapers, all in twos, all in ones, wool soakers and a million other types of diapers out there. Lots of mom make their own diapers and you can, too. If DIY is a lot to ask when you are still grappling with all the new information that comes with cloth diapering then you might want to check out your local Facebook Cloth Diaper Buy/Sell/Trade group. I find that diapers are cheaper on local groups, and no shipping means no wasted shipping materials. There are seemingly infinite types and brands of diapers and local B/S/T group makes it easy to try new things without buying new things. If you end up with fitted diapers playing a large roll in your diapering stash, you’ll almost certainly be buying products made by Work at Home Parents. I usually buy mine used off the B/S/T, but there are tons of WAHPs selling on Etsy and their own Facebook groups. If you are lucky, you might have a local cloth diaper store. My husband is willing to use cloth if the only thing he has to do is do up some snaps, so we own a stash of all in one diapers that are as easy to use as a disposable. The brand we’ve found to work best isn’t one that gets put up for resale often because most people love them and hold on to them. So we get our Thirsties Natural All In One diapers from our local store. Thirsties come with a paper tag and a bit of plastic attaching it to the diaper and that’s it, so buying from the store is pretty low waste for us. We also use cloth wipes, simple dampened with water, which is about as low waste as you can get in the diapering world. Tomorrow I’ll go over cloth diapering using all natural materials for those of you who want to stay plastic free on your cloth diaper journey.